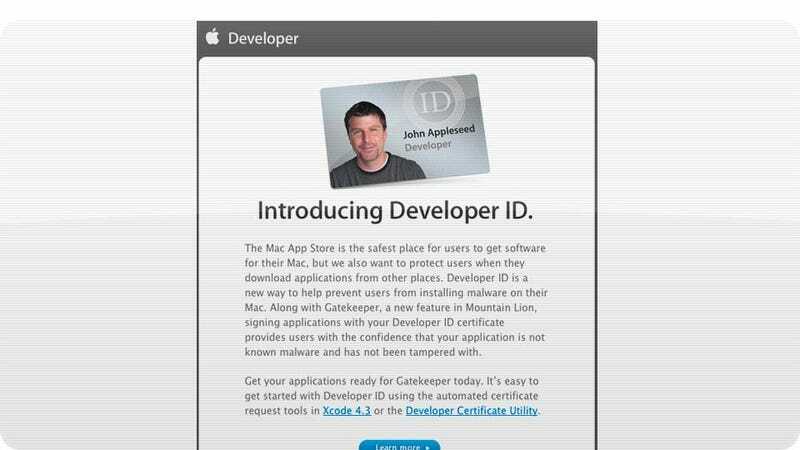 Apple sent out notice to its developers today of a new initiative called Developer ID, which will combat malware on OS X alongside the new-to-Mountain-Lion Gatekeeper. It's to keep us, the users, safe. But could it also be the next step toward a future where Apple decides what you can install on your Mac? Get your applications ready for Gatekeeper today. It's easy to get started with Developer ID using the automated certificate request tools in Xcode 4.3 or the Developer Certificate Utility. Ostensibly, Developer ID is a way for developers to get Apple's seal of approval without being distributed through the App store. And it is, unless it's used for something more obtrusive. Almost from the time Mountain Lion was announced, people started raising eyebrows about what Gatekeeper—the new tool that can restrict instillation of apps to only those downloaded from the App Store—meant for the future of app distribution for OS X. Are we headed for a future where the only apps that you can install on your Mac are those that are combed and curated by Apple in the App Store? Well, not yet. But it certainly seems like seeds are being sown. And Developer ID fits hand in hand with that. It's not just Gatekeeper. Apple's also updated the TOS of the App Store to be more aggressive about "sandboxing" apps as a safety precaution. That means, basically, that apps that are sold through the App Store can be aggressively limited with how they interact with the rest of your computer. Deeply integrated apps like Dropbox or Growl or dozens of others are one of the hallmarks of OS X. And while the apps might not be permanently broken, they'll need deeper permissions to operate as they do now. Permissions that might—someday—hinge on a Developer ID in good standing with Apple.